Richard Wagner, Franz Liszt (not really) and Der Ring des Nibelungen. Richard Wagner’s second wife, Cosima, was the daughter of Hungarian composer Franz Liszt. 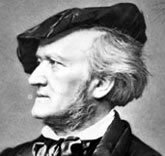 Several (a lot) other things about Wagner I didn’t know either. I am not a Wagnerian expert, but I did think I knew a little about Lizst. I did not realize that Franz and Richard even knew each other, much less were in-laws. Oh well. But this blog is not about Cosima, or even Liszt. It is about Richard Wagner, and not exactly about him either. It’s about Wagner’s composition, Der Ring des Nibelungen (The Nibelung’s Ring) and a day-long celebration in Sunnyvale CA. On Sunday the 22nd of May, I attended a 14 ½ hour Ring marathon, in honor of Wagner’s birthday. (a little late this year, but better late than never, right? ) The cycle started at sun-up – approximately 5:40 a.m. I was NOT there that early, but a friend of mine was. She’s a real Wagnerian aficionado. The first opera was not traditional. It was set in some smoky gray 19th or 20th century sanitoruim or perhaps the one where the setting is somewhere in the Industrial Revolution. A hydro-electric damn I think, was supposed to be the Rhine. I am not sure though. 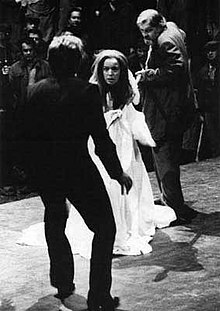 The latter is perhaps the most famous modern one – the centennial production in 1976 directed by Patrice Chéreau and conducted by Pierre Boulez. It was based on the Ring as a revolutionary drama and critique of the modern world, as written about by George Bernard Shaw in ‘The Perfect Wagnerite‘. I read that Early performances were booed but the audience of 1980 gave it a 90 minute ovation in its final year; the production is now generally regarded as revolutionary and a classic. I myself couldn’t figure out what anyone was doing or who anyone was. The people were I kept reading the libretto and saying, “Oh that must be … or they must be at …” – whatever, but with the post Bolshevik revolution worker gray suits on the men (or was it business suits) and white sheets on the women, I never did figure it all out. I suppose that singers and producers get tired of the traditional scenes and costumes, but I need them. One of the other rings was a post-modern version too. Siegfried, I think. Arrgh. Apologies to Wagner lovers and especially the modern version fans. I guess that makes me definitely Not a Wagner aficionado, but I really need to see the horned helmets to know who’s who. It was like a version of Macbeth I saw once in Stratford. (RSA too) The only time I ever made to England. I thought my mother would like it, witches on the moor and all that. But they played some kind of post-modern psychological version that even I didn’t always know who was what in. I am sure my poor mom was confused. Very disappointing. That’s why something is called a classic, guys, because it is ageless. Go all the way to England and can’t even see witches stirring their cauldrons. Just call me a purist. Don’t mess with Wagner or Shakespeare, thank you. I think they knew what they were doing. Götterdämmerung (Twilight of the Gods). Wagner’s idea of Gesamtkunstwerk (“total artwork”), the synthesis of all the poetic, visual, musical and dramatic arts was brought to its height by the four-opera cycle Der Ring des Nibelungen (1876). 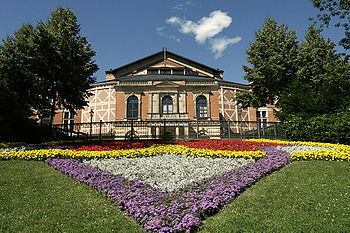 To try to stage these works as he imagined them, he even built his own opera house, the Bayreuth Festspielhaus. The Bayreuth Festspielhaus or Bayreuth Festival Theatre: Bayreuther Festspielhaus) is an opera house north of Bayreuth, Germany, dedicated principally to the performance of operas by the 19th-century German composer Richard Wagner. It is the excl usive venue for the annual Bayreuth Festival, for which it was specifically conceived and built. The design was adapted by Wagner, without the architect’s permission, from an unrealised project by Gottfried Semper for an opera house in Munich, and built under Wagner’s supervision. Its construction was funded principally by Ludwig II of Bavaria. The foundation stone was laid on 22 May 1872 (Wagner’s birthday). The building was first opened for the premiere of the complete four-opera cycle of Der Ring des Nibelungen (The Ring of the Nibelung), from August 13, 1876 to August 17, 1876.